Increase your comfort and decrease your energy bills with spray foam insulation in Glen Burnie, Pasadena, Annapolis, and nearby cities and towns such as Rockville, Annapolis, Bowie, Bethesda, Upper Marlboro, Waldorf, Laurel, and more. 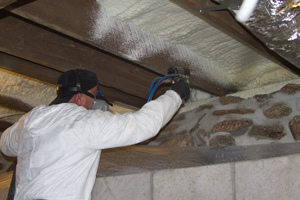 We are your trusted spray insulation contractor in Maryland. Schedule A Free Spray Foam Insulation Estimate! This customer of ours had some work done with us a few years ago. So, when a new insulation project came up, he knew who to come to for a quality job. He had built a new addition onto his house and wanted to make sure that it was properly insulated before finishing it. Our home comfort specialist provided the homeowner with a few solutions to achieve this. They ultimately chose one that we felt was the best option - applying spray foam to the walls, rims and bands was a great way to make sure the new addition was effectively air sealed as well as insulated. The homeowner can now enjoy his new space comfortably. Air ducts that are not properly sealed lead to the home's heat or air conditioning escaping through air leaks before reaching the destination. This causes the home to become less energy efficient and causes the homeowner to pay more for heating or air conditioning that is not reaching the rooms of the house. By sealing the air ducts the air stays inside the ducts and is properly transported to the rooms. This makes the home more energy efficient and saves this Bowie,MD homeowner money on the energy bill. Call or contact us online for a Free Estimate -- we are your trusted insulation contractor in Pasadena, Annapolis, Glen Burnie, Washington D.C., Bowie, Annapolis, Rockville, Upper Marlboro, Waldorf, Laurel, Bethesda, and more.